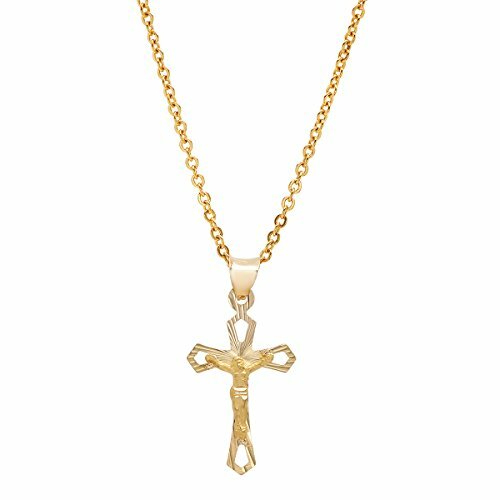 14K Solid Yellow Gold Diamond Cut Crucifix Pendant in 14K Gold cable chain -18"
NECKLACE INFO: 14K Solid Yellow Gold Cross with Diamond cut high polish Finish. This Jesus Crucifix hangs in a 14K yellow gold cable chain which is diamond cut finish for extra shine. 14K GOLD GUARANTEED: 14K gold stamped 14K for authenticity , A beautiful classic and elegant design. Styled by our top of the line designers in Italy , this cross crucifix necklace will get you all the compliments. Free Branded Jewelry Pouch Included, perfect for sending a gift to a loved one. Velvet jewelry pouch keeps jewelry protected and scratch free. Also makes this perfect for gifting for your friend or loved one. 100% SATISFACTION GUARANTEE - We want you to love your new jewelry, so rest assured we will be here until you are 100% satisfied with every purchase from Pori Jewelry. Hassle free returns or exchanges for 30 days. Service with a (albeit digital) smile : ) You will love this 14K Solid Yellow Gold Diamond Cut Crucifix Pendant in 14K Gold cable chain -18"
If you have any questions about this product by Pori Jewelers, contact us by completing and submitting the form below. If you are looking for a specif part number, please include it with your message. 18K Solid Yellow Gold Diamond Cut Round Cable / Anchor Chain Necklace- perfect alone or for pendants-18"